Pizza, Calzones, Subs, Salads and more! 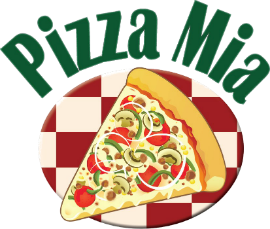 We at Pizza Mia are proud to serve our delicious food whether you enjoy it in our restaurant, pick it up to go, or take advantage of our fast and courteous delivery. We appreciate your business, and look forward to our next opportunity to serve you! Courteous delivery persons. Food is always fresh, hot. Fast service.